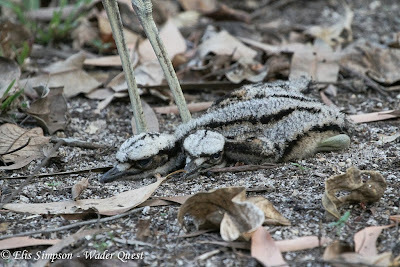 Wader Quest: Well done Wader Quest South Africa! Well done Wader Quest South Africa! 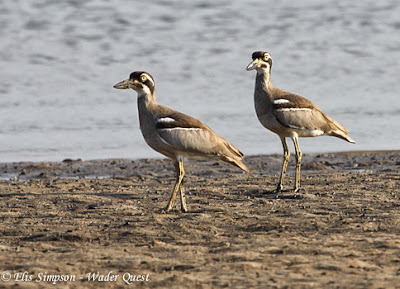 We have just received a donation of £80.00 from Wader Quest South Africa on our justgiving site. This donation came about thanks to Peter Sharland giving a talk about Wader Quest to BirdLife Northern Natal. He and the WQSA team generated this donation from those that attended. A great effort Team SA and thanks, that has really boosted our funds putting us nearer still to our target of £3,000. As if by way of celebration, we were out getting ourselves a new WQ species. 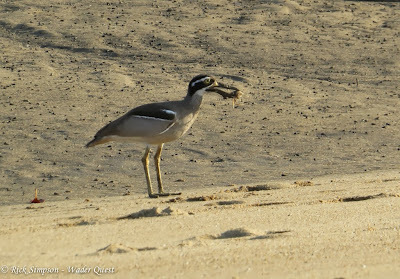 Beach Stone-Curlew species number 145. Beach Stone-Curlew Burhinus magnirostris: Barron Rivermouth, Cairns, Queensland, Australia. It swallowed that great crab whole! Whatever you choose to call them; stone-curlew, thick-knee or dikkop, the Burhinus genus is a fascinating collection of birds. We have been lucky in seeing all those that we have looked for so far, adding tonight the Beach Stone-Curlew here in Cairns, Queensland. 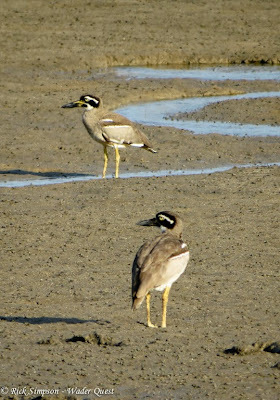 Beach Stone-Curlew Burhinus magnirostris: Barron Rivermouth, Cairns, Queensland, Australia. We met Martin Cachard at the site who has been instrumental in organising much of our trip to Australia and who has provided much good information, support and contacts, so a big thanks to him. Martin and me watching the Beach Stone-Curlews. We enjoyed watching a pair of these birds which look like colourful Crab Plovers, they have the most striking plumage of those we have seen so far. After this excitement we visited a place called Centenary Lakes. Here we came across a pair of Bush Stone-Curlews. We were surprised that they did not simply run away at our approach, but instead adopted strange frozen stances. 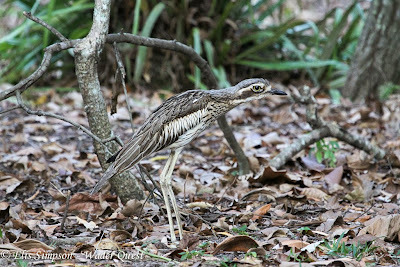 Rufous morph Bush Stone-Curlew Burhinus grallarius: Centenary Lakes, Cairns, Queensalnd, Australia. In doing so one of the birds stood up and two large chicks dropped out from under its wings. 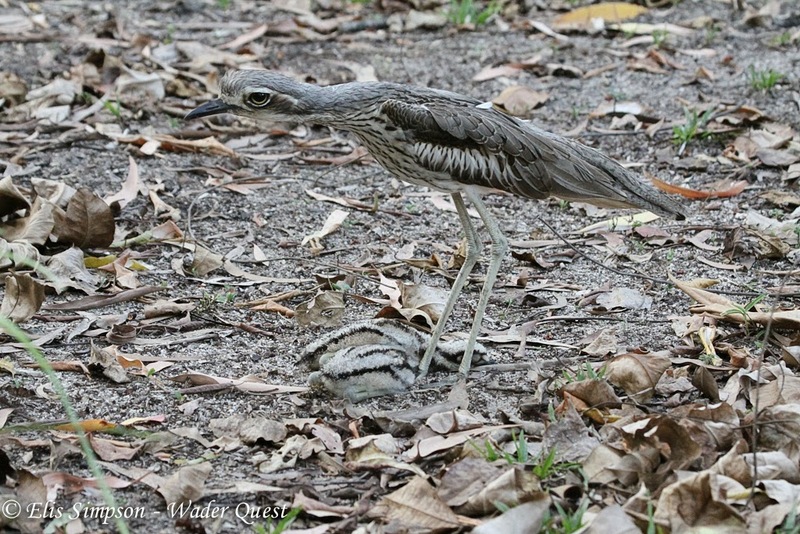 Bush Stone-Curlew Burhinus grallarius: Two chicks at the feet of their parent, Centenary Lakes, Cairns, Queensalnd, Australia. We took a few photos and quickly left so as not to stress the birds unduly. It was interesting to see that the pair was made up of one rufous and one grey morph bird, wonder what the chicks will be? Grey morph Bush Stone-Curlew Burhinus grallarius: with chicks at its feet, Centenary Lakes, Cairns, Queensalnd, Australia.